Walking in the footsteps of heroes. One of the most popular trekking routes in the Himalayas an experience you'll never forget. 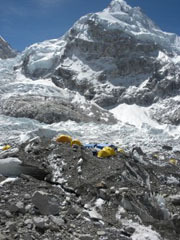 You'll visit local villages, Tengboche monastery and the Khumbu glacier. A great opportunity to brush up on your photography skills. With stunning views off Ama Dablam, Everest and beautiful Himalayan snow-capped peaks. For most of the trek we'll be staying in the local tea houses. They usually have a good selection of hot food and drink. However the washing facilities are basic and you may have to share a room with another member of the trekking group. What's not included flights, Beer and soft drinks and tips etc. This trek is run by our in country team for teams smaller than 8. Unless on a bespoke trip where alternatives arrangements have been made. The trip costs £1,300 exc. Flights. Suitable for anybody interested in experiencing a new culture and willing to put the effort in to climb to 5,360 metres. possible add-ons include: A scenic flight over Everest and Chitwan National Park where you can experience elephant rides and relax by the pool. minimum group size 4 people for bespoke start dates.